Commentary: A great figure that's kind of cheap on the Internet right now, Maz Kanata is based on her The Force Awakens appearance - meaning she's got no jetpack and she's not a hologram. For some reason Hasbro dragged their feet on a number of cool The Force Awakens figures until a couple years after the movie, and this one came out in time for the sequel. It's a good figure - but it's also about 4-inches tall. There's a bit more plastic here, but it's basically about the same kind of product as a 3 3/4-inch super-articulated figure at a significant mark-up because of how these things sell in assortments. Also she has a killer paint job. Her metallic skin has numerous wrinkes, and it looks stunning. The light shines off it and gives it a rich sense of detail, plus her eyes are a little less creepy than they are in the movie. It's kind of fascinating to see so many rings and special details on a figure like this, because it says a lot about the movie design too. We've seen numerous aged characters eschew adornments. Jabba the Hutt wears a tattoo and a smile, and he's about 1,000 years old. Yoda was 900 and had a brown shirt, brown pants, a jacket, and a necklace with a belt. Maz clearly has a distinctive sense of style with more color and accessories than we would see on most characters across multiple movies. Articulation is good, and it needs to be given that you're getting a 4-inch figure at a 6-inch price. Bend-and-swivel joints are used on the elbows and knees, plus she has rocker ankles. This is good, but the small feet also show Hasbro's ongoing problems with foot pegs. The holes are so shallow no stand could use them, and there's no other standardized stand for these action figures. Thankfully her center of gravity allows her to stand unassisted, but with 24 good points of articulation you can get a lot out of her. I was unable to get her thigh cuts to move, but it could just be my sample combined with a fear of snapping her legs off. 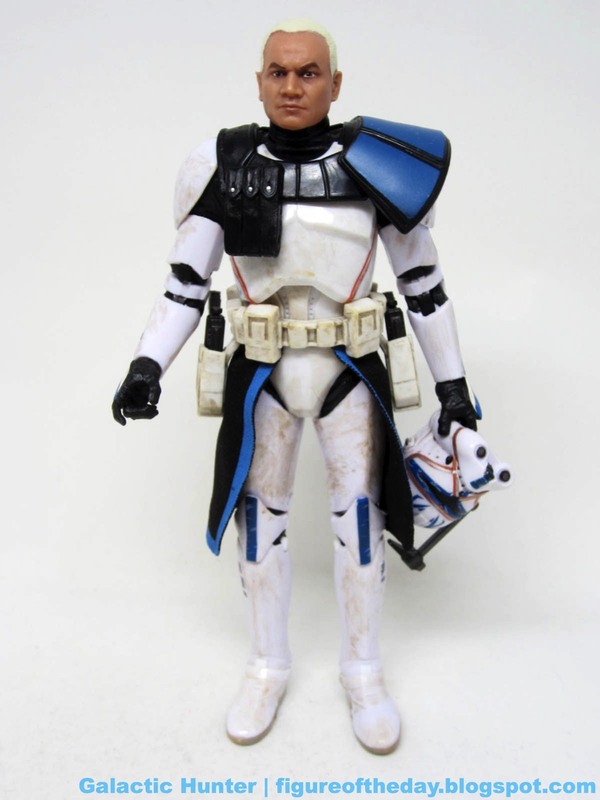 This may be the finest figure in The Black Series in terms of decoration and could even be one of Hasbro's most lavishly decorated action figures. Most figures tend to be fairly simple affairs with a couple of colors, so this one really did a nice job. And on top of that you get her blaster, Luke's lightsaber hilt, and a chest that opens. I wish it had a hinge joint instead of a piece of plastic that bends, but that's how these things go sometimes. 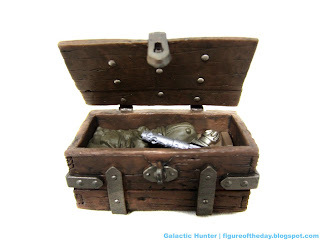 Hasbro did a nice job giving us a weathered-looking wooden box, even going as far as to paint the rivets under the lid. I am in awe that they bothered, but clearly they got their paint budget's worth out of this one. Commentary: Nifty! 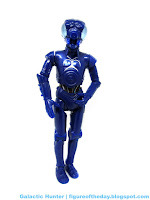 The Blue LOM-series Protocol Droid brings us more of a class of droid that really hasn't been seen much. I don't know where the blue droid with chest pinstriping idea came from, but it's neat. I'd like to have had Disney do things like this on other colors, as it offers us something truly different. The blue finish is - as far as I know - unique to this figure. 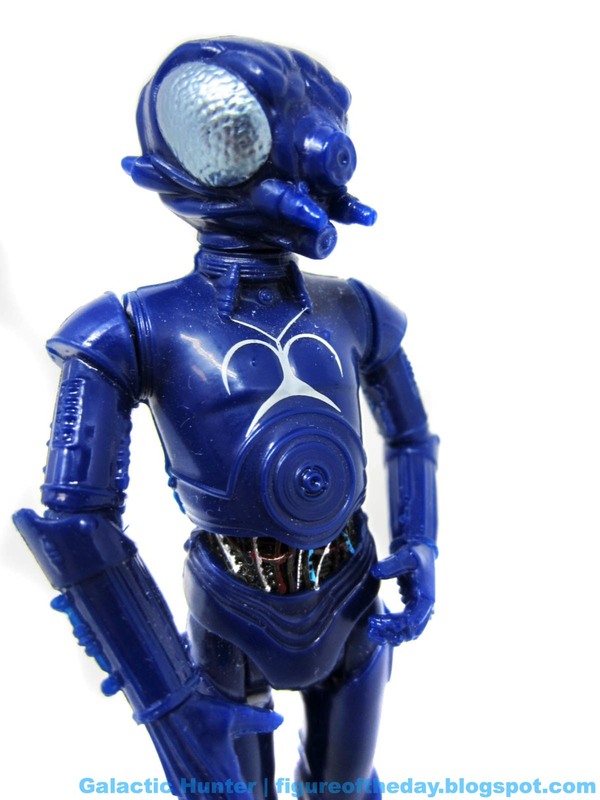 If there's another fictional instance of this kind of droid, I've not seen it. The chest on this sample is a 3PO body, with 3PO arms and Death Star Droid legs. You can build whatever you want. The light blue metallic eyes look great, but I wish the "face" had some more detailing. The bare blue is a little light, a couple of painted details would have made a ton of difference. Since it has no real specific place in the mythos, it's great. I could put this to work in that Sail Barge we may or may not get, or in that other playset Hasbro will never make. It has no gun, but it looks cool and seems like it would fit in off-camera pretty nicely. You don't need this figure. You really don't. It's one of those things that you'll ignore now and will either be worthless in 10 years or will cost more than your shoes. I don't know which, and that's why I bought it now. Or rather Shannon did, and I paid him back for it, because Shannon is good people. Commentary: New! The First Order Gunner is barely seen in the movie and reference photos online are hard to find - there's also a LEGO minifigure, but not a lot of details are out there for the costume. With a massive underbite-looking visor, this figure does a good job matching the LEGO figure and Topps trading cards, which may as well count as reference. The figure uses stunningly little paint, with glossy gloves and boots plus a First Order symbol on one shoulder. True to the reference, everything is black and molded in color. It's almost a crime Hasbro didn't sell these individually as the cheapest figures in their library that are completely accurate. The 5-jointed figure is a gem. It stands, it holds the blaster, and it even sits with the legs at a reasonable angle at which they can sit in vehicles. The thin male body is in a plain black suit with space jodhpurs, obviously because someone is evoking a certain kind of image in our collective cultural memory. 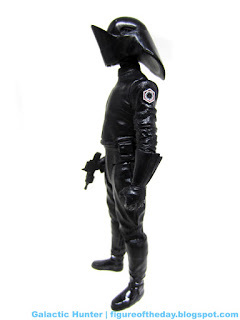 The bizarre, faceless helmet resembles the original Death Star's gunners after an accident. The little pouches on the belt are a nice touch, and I can't find anything specific I don't like about the figure. His blaster fits in his hand, and while simple it's an effective toy. 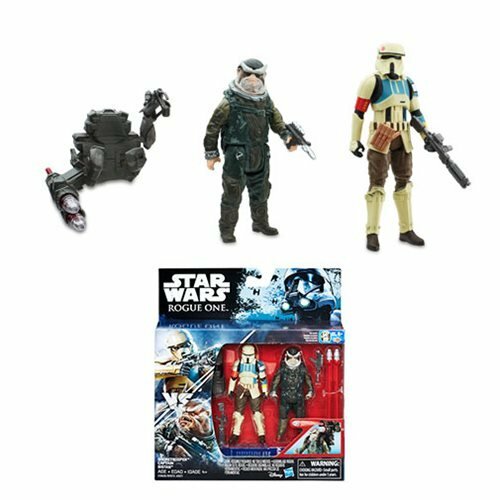 If you see this set, go ahead and get it - three new figures and one deco variant is a pretty good mix. The Rogue One 4-pack was a little more exciting, but this is still plenty good. 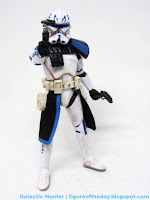 Commentary: Apparently someone like Clone Captain Rex. There are two major releases - the HasCon release has a "toy deco" head, painted up like all the figures you've seen in the past. 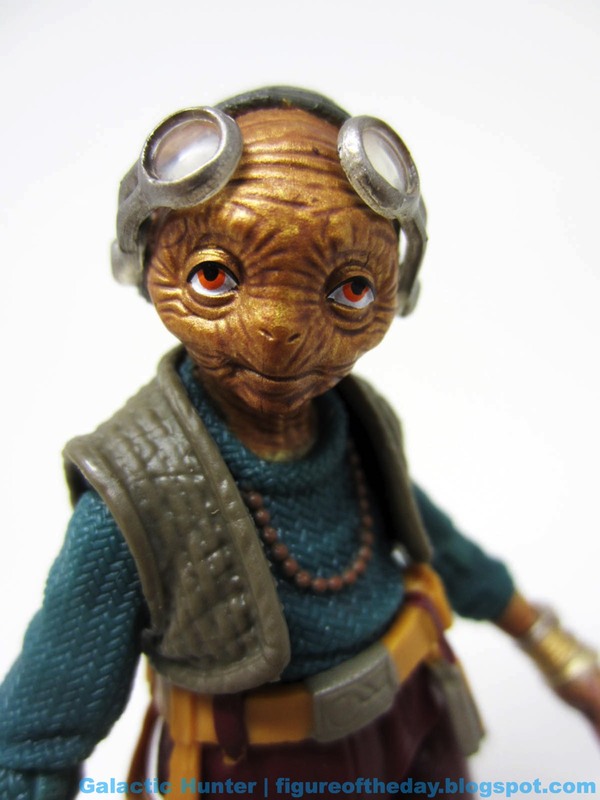 This new non-exclusive one uses the new "realistic deco" we're seeing on Marvel Legends and The Black Series, essentially painting a portrait - complete with glossy eyes - right on the plastic face. Some look better than others, and this is one of the best. It's not quite the level of realism one gets from Hot Toys, but for the price and size it's pretty spectacular. 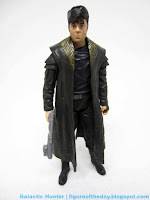 It's far superior to anything else going at this size and price point, and it's so odd to have a photorealistic cartoon character action figure in the style of a movie line. 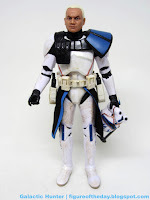 I like the armor deco - glossy white plastic has been massaged with dirty paint, giving a faux-weathered look. It's OK - it's not as good as the new face technique. The detailing is still precise and buttons are decorated, with weathering baked in to the blue stripes just as well as we've seen before. The blasters are a snug fit in the holsters, but they do fit - they fit in the hands too. A blue stripe on the kama also looks nice, but it doesn't seem aligned perfectly. On mine, you'll note a little black peeking out. It's by no means bad - just one of those little imperfections they may some day stamp down. HasCon Rex has the classic-style, simpler face deco. Main release has a photo printed on the plastic, basically. The armors are the same. I'd steer you toward whatever you can get more cheaply - the single box one is pretty spectacular and will likely be the new gold standard against which other troopers are judged. 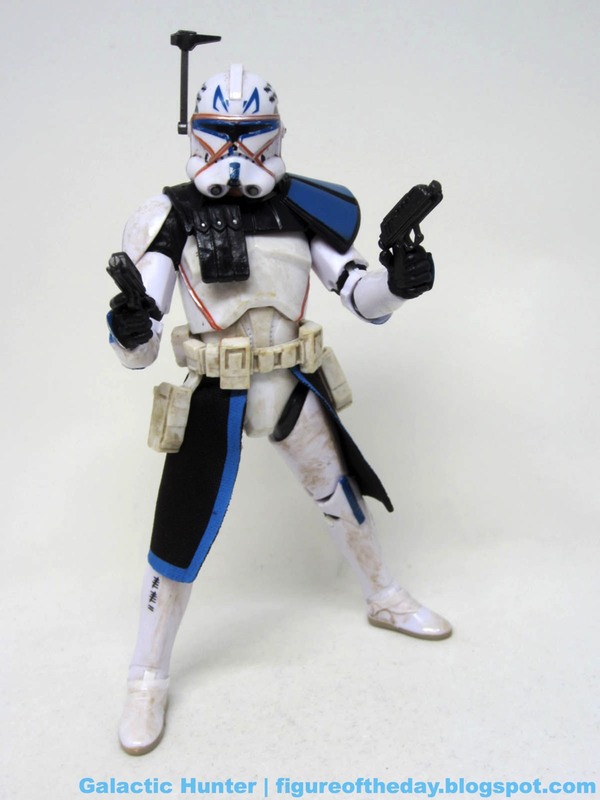 It's basically the existing Clone Trooper body, but with a new belt, torso, helmet, and head. And pauldron. The a skirt. It's cloth! It's pretty good too! This time around the pauldron is affixed in place, not floaty or twirly like some of the others. Liberal amounts of damage are applied to the armor, as are hashmarks. You can see where the helmet and armor are welded together with burn marks complete with raised sculpted elements. I like it and hope they drag in Obi-Wan Kenobi and a few more costumes from The Clone Wars. Also, this year is the 10th anniversary of that TV show. Commentary: The small version is good, the big DJ is better. 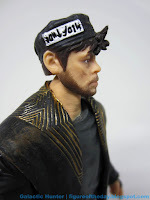 At this point I don't know if we'll see a super-articulated DJ, or DJ in his First Order duds, but we've got his Space Tom Waits costume and that's a good start. He has his hat, his coat, his belt, and his beard - and one glove. And rings. 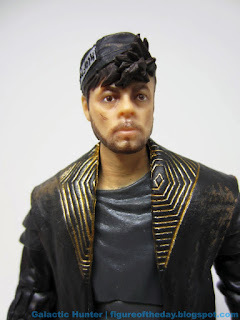 He's an ornate fellow with some facial fuzz with a really good Benicio del Toro face sculpt. He looks younger here than in the movie! The face has a decent beard, which has proven difficult a feature for Hasbro. Here, they printed it on using some new technique that results in more color and shinier gloss. It gives him a little more life, which is good, but getting the perfect scruff is a challenge. 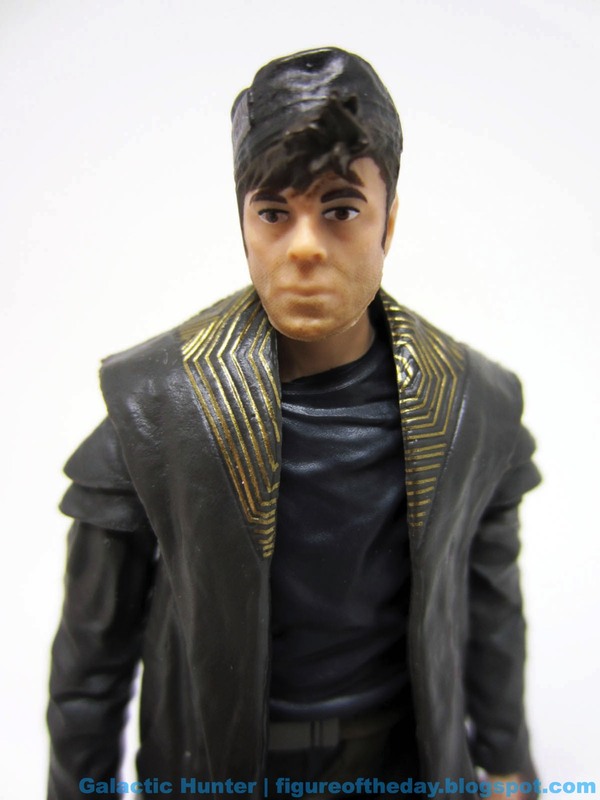 It's still better than the Poe figures. The beanie looks great, with a stylized metal plate that says "Don't Join" in the most stylized - and legible - Aurebesh lettering I've ever seen. This is the first time I've been able to look at something and know what it said without having to verify, but then again the context would also help. 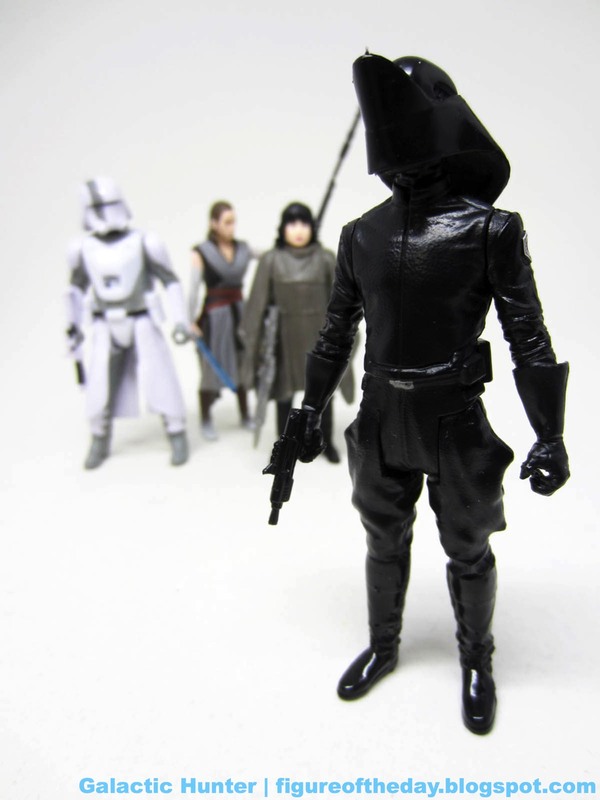 Articulation is standard The Black Series fare with bend-and-swivel hands, double-jointed knees, and all that jazz. 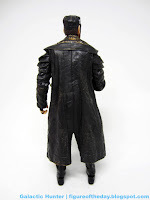 The coat renders the hip joints a little moot, and the double knees seem like overkill - but it's nice to have them. I'd like to see Hasbro completely eliminate the mid-torso cut joint, as it's visually ugly and functionally dubious. You can't really move it much with the coat, and it doesn't do much as an ab crunch. A one-piece body, or a joint only at the belt, would look and potentially function better. It's still very good - the joints are mostly hidden thanks tot he coat and costume design. The design seems perfect for action figures, but Hasbro had to translate it with the joints and the paint apps and the things of this nature. 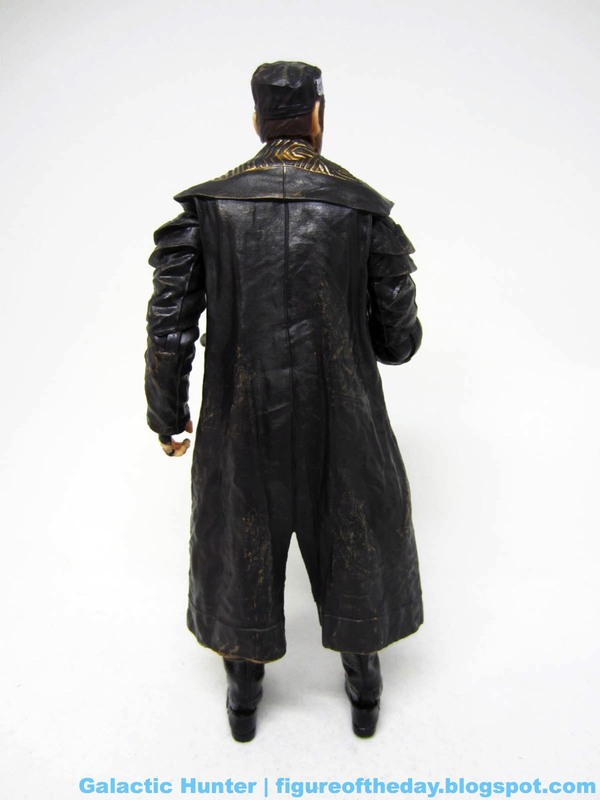 The ring detail on his hand is great, as is the glossy black on the boots. While it would seem little and big DJ figures were derived from a similar source, they're both great. 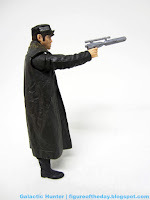 There are subtle differences with the 6-inch figure - complete with holstered small pistol - is the champ. I'd love to see a super-articulated, but I also freely admit that the main reason would be for a slightly better paint job on the head, blaster, and boots. 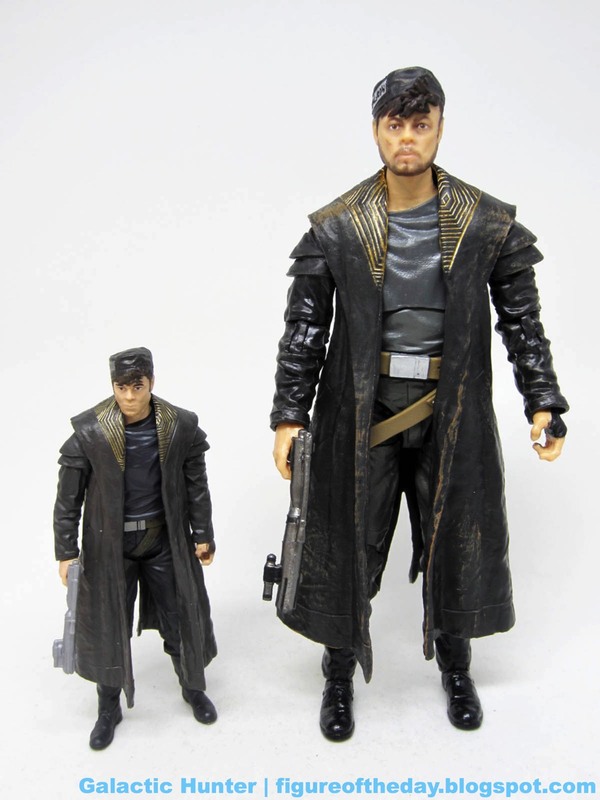 Hasbro did it well here, and he looks like he'd be right at home in any hive of scum and/or villainy. I've seen a few of these in stores, and given the assortment you might see some on your travels. I like it enough to say that I'm glad I got mine, and you may wish to do so online or elsewhere. I do not expect him to have additional runs in the future, if post-release Disney-movie figures to date have been any indication. Commentary: This is great. 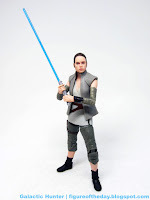 The best figure in the line - or at least the best version of the character from Hasbro so far - is Rey (Island Journey) as a 6-inch figure. 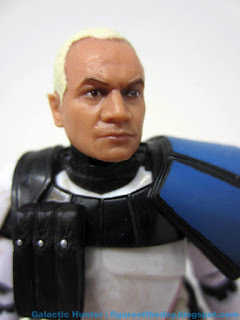 With this wave Hasbro started to deploy its new face painting techniques on a grander scale and I'm not 100% sure if this figure uses it or not. It doesn't look quite as exaggerated as the press photos, in person she looks eerily almost real. 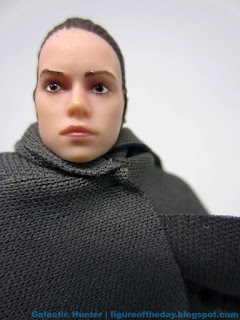 The eyebrows, eyes, and lips have a glossy finish that is a heck of a lot less toy-ey than the last version. It looks like her - it's good! It's really good! Hasbro has a lot of really good human faces, but as of right now I'd say this is the best. She is nicely articulated - but brings nothing new to the table. That's not a criticism so much as a resignation to the fact that Hasbro has seemingly decided what these figures can do in 2015 and will never deviate from the ball shoulders, double-hinge knees, rocker ankles, and whatnot. There are places to hide in more joints but I don't suspect they have an incentive to try them until production costs demand change - either to make the figure look like it has more value, or to bring costs down. Most of the joints are nicely hidden, but at this point I'd love to see them put some work in hiding the pins in the knees. Everything else looks superb, and the arms (and especially hands) are perfect to hold her accessories. I was surprised just how Hasbro cut the joints. The elbows are able to bend more than 90 degrees with wrists than bend and swivel as smoothly as you could hope. I had zero problems getting her hands on the lightsaber hilt. The hilt is a lot better than the Luke hilts - the detail on the switch is great, and the belt clip is angled when compared to the Luke releases. 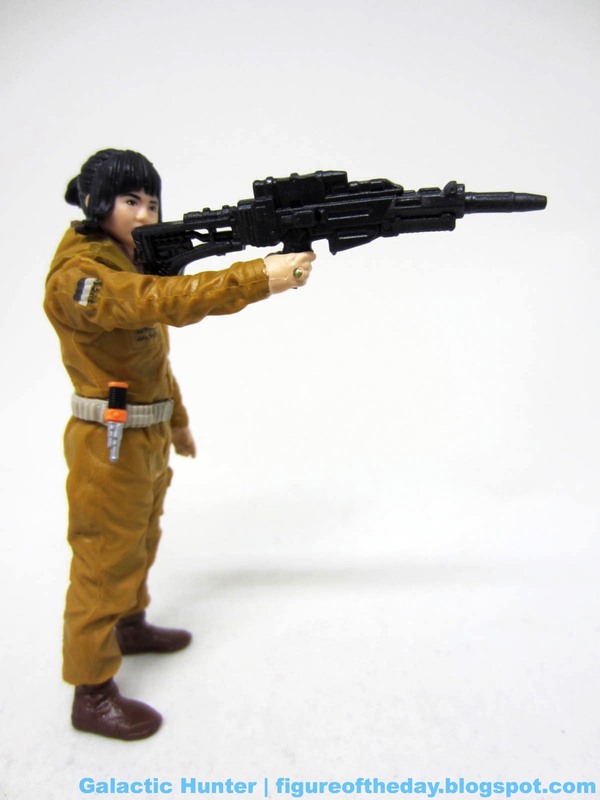 I don't really have much to say about the blaster and staff other than they're great at fitting in her hands or holster, so Hasbro did nice work here. This is probably my favorite 6-inch figure. Yeah, I know some of you don't like Rey. Fight me. Hasbro did a bang-up job here and you should buy one. The cape is great. The jointing is wonderful. Hasbro, please - assign a Jedi Knight (Jabba's Palace) Luke Skywalker to the designer of this figure. I want to see how they'll handle it, and then buy several. Well, OK, one. 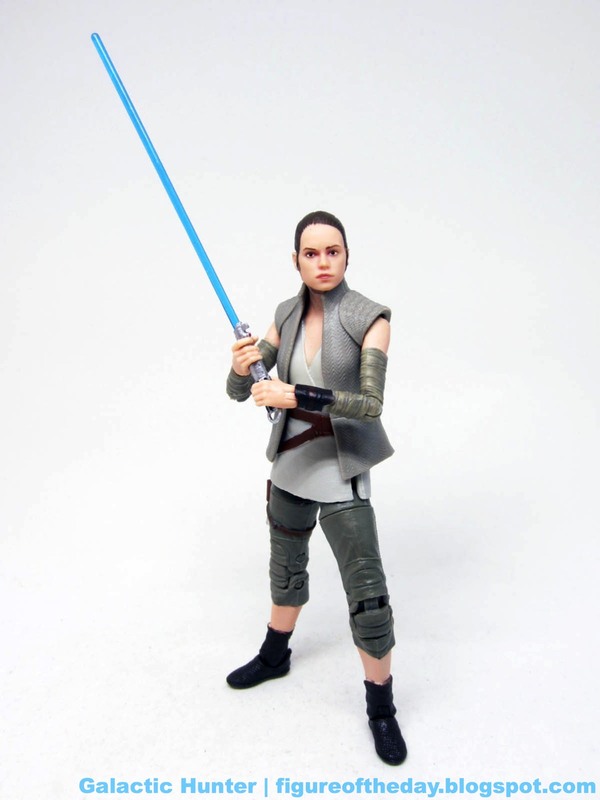 If you're new to this line, this Rey might be a great place to start. Commentary: One of the more fascinating things about The Last Jedi is how some really big names play relatively minor characters. Benicio Del Toro's character doesn't really get a name on screen, but DJ is what the box and credits say. This isn't the name his parents gave him, and with any luck they may keep it a mystery - a little mystery is welcome after the franchise explained almost too much during the prequel era. The construction of this figure is familiar. Five points of articulation and a wrap-around coat make this a lot like figures from the 1970s and early 1980s, preventing the figure from sitting while giving it a strong silhouette and a true-to-the-movie look. The painted coat lining was a real surprise - it's gorgeous! - but the underpainted rings is a little upsetting. That's what you get when costs are cut. Thankfully the sculpt is boffo, with a decent likeness and a slightly less rough looking incarnation of the man who portrayed Dr. Gonzo in one of the greatest movies to take place in bat country. 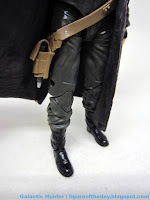 There's a holster but his giant rifle is too big, so he'll have to settle for carrying it in his hand. This is possibly the brownest costume of the series, even though the shirt is blue. The coloring is just so muted, it's like all life has been sucked out of it. This makes sense visually - it's not a "grey" character, but it's certainly a murky one. We've got stark white costumes and pitch black costumes, but heroism and villainy can wear almost any color. 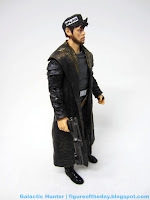 The more mercenary look suits the character well, with a great likeness for a 3 3/4-inch figure and even some sculpted space letters on his hat. I can't read them, but they're there. That has to count for something. 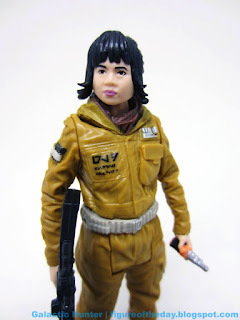 As a new character, I was surprised to see this figure sit - but in a wave with new versions of Rey, Luke, Leia, Jyn Erso, and R2-D2 it's only mildly surprising. I don't think there's a figure collector that expected the fourth nearly identical release of Jyn Erso to outsell an actual new character - a villain, no less - but here we go. 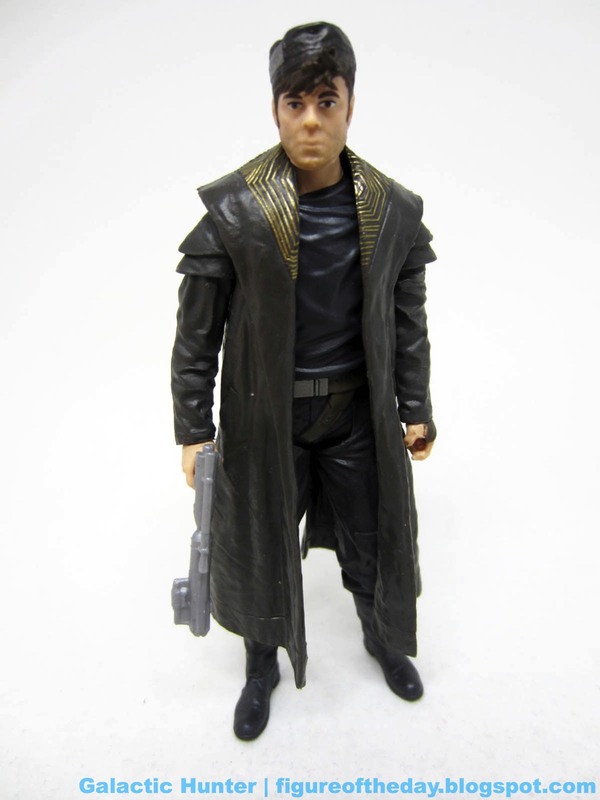 Things are surprising, like the fact that this figure is good and apparently you aren't buying it. What's the matter with you? 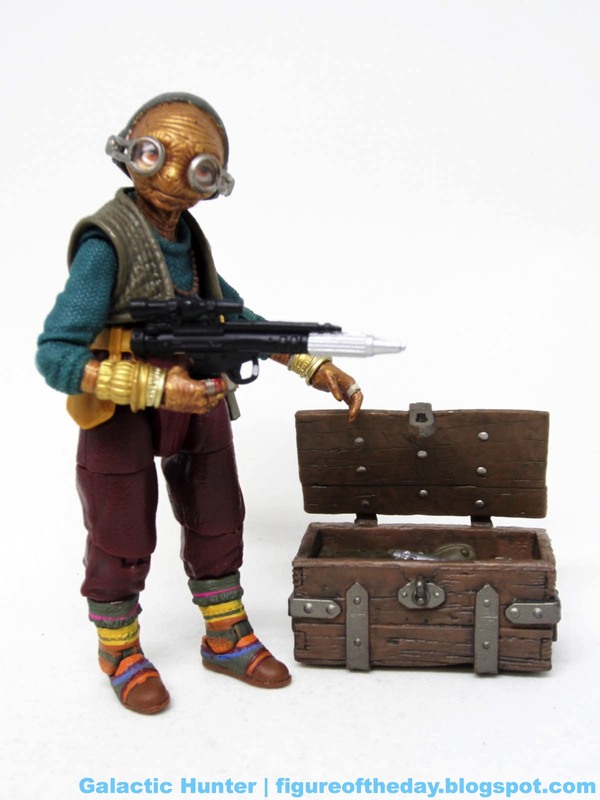 This is one of the better figures in the line, and he looks like he could hang out in any cantina or general hive of villainy. 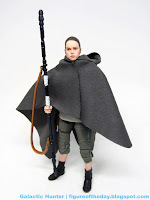 This is one of my favorite new character figures from the movie - it's also one of only four new-from-The Last Jedi named non-trooper characters to get a 3 3/4-inch action figure for this movie so far. If you don't count pilots, he's only one of two. 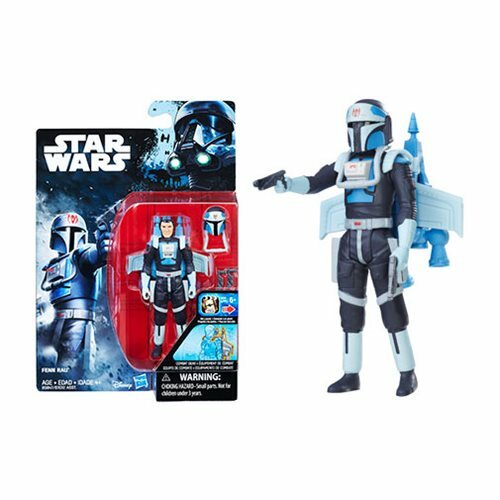 There's a reason the press is reporting Star Wars toy interest has been a lot more limited - even with a gem like this, there's a lot less to hold our interest in this increasingly samey era of toys. Force Link Notes: “Hey, I’m a thief.” “Oh, for Hutts sake!” “I can get you outta here.” “If the price is right.” “Let’s get this over with.” And the usual combat effects. It's a soundalike. Image: Adam's photo lab. 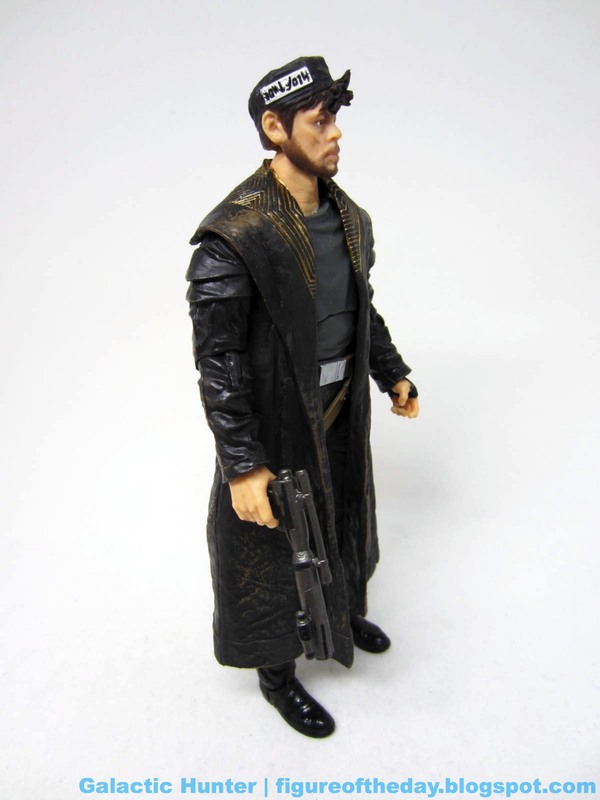 Note: this image is of the same figure from Kohl's exclusive set. It's fundamentally the same figure. 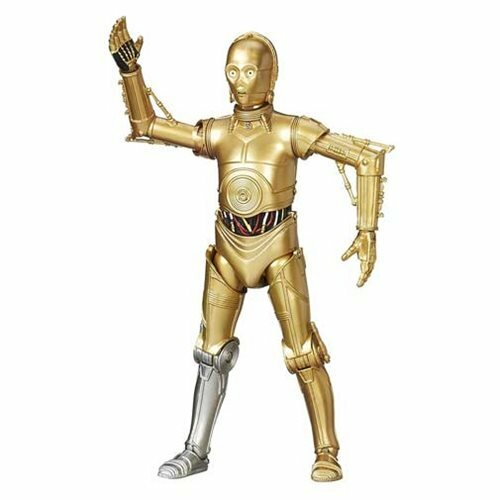 Commentary: I saw Resistance Tech Rose at Walmart prior to "Force Friday," along with Finn and C-3PO just sitting there for a few days while other figures came and went. "Uh oh," I thought, "Unless she's the new Rey we're in trouble. Rose started to move after the movie came out, but she was not popular prior to its release. As a space mechanic, she gives life to part of the Resistance we don't see much. The character is a good one, the actress was a delight, and the figure is perfectly fine. I wish Hasbro didn't release a super-articulated version of the same costume at the same time - and then rerelease this figure in a 4-pack at Kohl's - and then include the same figure in a subsequent wave yet again - but that's what planning can get you. Much like Rey, there's a lot of the character in basically the same costume one too many times. It's a good figure, but what we got was overkill. Mercifully, it's a good figure. The eye paint is sharp, the hair sculpt is good, and the printing on her speed suit is fantastic. I'm not sure why they opted to mold her mustard-colored hood as a separate piece of painted plastic, but it's not much of an eyesore. 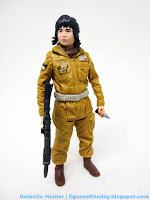 Her cargo paints have painted bits, her various greeblies are decorated nicely, and the belt can hold her taser weapon. Mostly. It's not a perfect fit, but you can wedge the tab in there. They could've done a better job here. She has no problem holding her rifle or her taser in her hands, nor does she have problems standing or sitting. Other than the belt/tab compatibility issue, Hasbro did a solid job here. The outfit has a lot of decent details, including her secret society ring from the film. That's a nice touch. Can you believe we live in an era where my complaint is that Hasbro made a perfectly good figure and made enough of it to go around in multiple channels and in multiple styles? I feel ridiculous. I enjoyed watching Finn and Rose be idiots and get thrown in prison for a parking ticket in Space Vegas. They're charming, underqualified special agents on an adventure that's beyond their pay grade that makes a bad situation worse - yet they're charming and I am glad they didn't die. I'd be curious to see her on a live-action TV show, and at least so far it looks like we aren't going to see seas of unsold Rose figures. If you don't have a Rose, this is a good one - the super-articulated one is better and has more painted details, but this one is cheap and very good. Get what makes sense for your budget and availability. Force Link Notes: "Blast them!" "Bullseye!" "I can fix anything!" "We have a mission to complete." "You can’t give up on the Resistance."